Chad Pipkens caps a smoking hot run to end the 2015 Elite Series season with his 2nd consecutive Bassmaster Classic berth! Three top fives in a row, and four top tens vaulted Pipkens into 27th place in Bassmaster Angler of the Year points with 511! 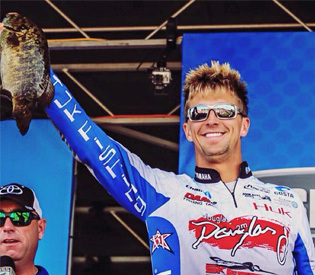 Pip topped off the season with a strong 5th place finish in the Toyota Bassmaster AOY Championship on Sturgeon Bay with 15 smallmouth bass weighing 45 pounds 11 ounces to earn $12,000 in AOY winnings! Chad say, “Let’s keep it rolling!” as he drives over from Sturgeon Bay, Wisconsin this week to fish the final Bassmaster Northern Open on Lake Erie at Sandusky, Ohio.